They will take effect on 23 May 2018. Warranties and Limitation of Liability (Or the Things You Cant Sue Us For). The Terms are a legally binding contract between you and Generation Success. Please note that Section10. Disputes with Generation Successcontains an arbitration clause and class action waiver. By agreeing to the Terms, you agree to resolve all disputes through binding individual arbitration, which means that you waive any right to have those disputes decided by a judge or jury, and that you waive your right to participate in class actions, class arbitrations, or representative actions. This contract sets out your rights and responsibilities when you use, so please read it carefully. By using any of our Services (even just browsing one of our websites), you’re agreeing to the Terms. If you don’t agree with the Terms, you may not use our Services. You with us? Great, read on! Both Generation Success and its third-party partners process members’ personal information (for example, name, age, email address, and phone number) and are therefore considered separate and independent data controllers of buyers’ personal information under EU law. That means that each party is responsible for the personal information it processes in providing the Services. For example, if a third party accidentally discloses a buyer’s name and email address when fulfilling another Client’sorder, the third-party partner, not Generation Success, will be responsible for that unauthorised disclosure. If, however, Generation Success and third party partners are found to be joint data controllers of buyers’ personal information, and if Generation Success is sued, fined, or otherwise incurs expenses because of something that you did as a joint data controller of Client’s personal information, you agree to indemnify Generation Success for the expenses it occurs in connection with your processing of Client’s personal information. See Section 9. Indemnification (or What Happens If You Get Us Sued) below for more information about your indemnification obligations to Generation Success. You must be 18 or older to use our Services. Minors under 18 and at least 13 years of age are only permitted to use our Services through an account owned by a parent or legal guardian with their appropriate permission and under their direct supervision. Children under 13 are not permitted to use Generation Success Services. You are responsible for any and all account activity conducted by a minor on your account. Choose an appropriate name. If you decide to not have your full name serve as the name associated with your account, you may not use language that is offensive, vulgar, or infringes someone’s intellectual property rights, or otherwise violates the Terms. You are responsible for your account. You’re solely responsible for any activity on your account. Also, your accounts are not transferable. Let’s be clear about our relationship. These Terms don’t create any agency, partnership, joint venture, employment, or franchisee relationship between you and Generation Success. Don’t Use Our Services to Break the Law. You agree that you will not violate any laws in connection with your use of the Services. This includes any local, state, federal, and international laws that may apply to you. For example, it’s your responsibility to not engage in fraud, theft, anti-competitive conduct, threatening conduct, or any other unlawful acts or crimes against Generation Success, another Generation Success user, or a third party. Share Your Ideas. We love your suggestions and ideas! They can help us improve your experience and our Services. Any unsolicited ideas or other materials you submit to Generation Success (not including Your personal details) are considered non-confidential and non-proprietary to you. You grant us a non-exclusive, worldwide, royalty-free, irrevocable, sub-licensable, perpetual license to use and publish those ideas and materials for any purpose, without compensation to you. Termination By You. We’d hate to see you go, but you may terminate your account with Generation Success at any time from your account settings. Termination By Generation Success. We may terminate or suspend your account and your access to the Services at any time, for any reason, and without advance notice. If we do so, it’s important to understand that you don’t have a contractual or legal right to continue to use our Services, If you or Generation Success terminate your account, you may lose any information associated with your account. We May Discontinue the Services. Generation Success reserves the right to change, suspend, or discontinue any of the Services at any time, for any reason. We will not be liable to you for the effect that any changes to the Services may have on you. People You Interact With. You can use the Services to interact with other individuals, either online or in person and at events. However, you understand that we do not screen users of our Services, and you release us from all liability relating to your interactions with other users. Please be careful and exercise caution and good judgment in all interactions with others, especially if you are meeting someone in person. Gift Cards and Promotions. You acknowledge that Generation Success does not make any warranties with respect to your Gift Card balance and is not responsible for any unauthorised access to, or alteration, theft, or destruction of a Gift Card or Gift Card code that results from any action by you or a third party. You also acknowledge that we may suspend or prohibit use of your Gift Card if your Gift Card or Gift Card code has been reported lost or stolen, or if we believe your Gift Card balance is being used suspiciously, fraudulently, or in an otherwise unauthorised manner. If your Gift Card code stops working, your only remedy is for us to issue you a replacement Gift Card code. By participating in a special offer or promotion, you agree that you may not later claim that the rules of that special offer or promotion were ambiguous. | Warranties. Generation Success is dedicated to making our Services the best they can be, but we’re not perfect and sometimes things can go wrong. You understand that our Services are provided “as is” and without any kind of warranty (express or implied). We are expressly disclaiming any warranties of title, non-infringement, merchantability, and fitness for a particular purpose, as well as any warranties implied by a course of performance, course of dealing, or usage of trade. Liability Limits. To the fullest extent permitted by law, neither Generation Success, nor our employees or directors shall be liable to you for any lost profits or revenues, or for any consequential, incidental, indirect, special, or punitive damages arising out of or in connection with the Services or these Terms. In no event shall Generation Success’s aggregate liability for any damages exceed the greater of one hundred ($100) US Dollars or the amount you paid Generation Success in the past twelve months. Some jurisdictions do not allow limitations on incidental or consequential damages, so the above limitations may not apply to you. We hope this never happens, but if Generation Success gets sued because of something that you did, you agree to defend and indemnify us. That means you’ll defend Generation Success (including any of our employees) and hold us harmless from any legal claim or demand (including reasonable attorney’s fees) that arises from your actions, your use (or misuse) of our Services, your breach of the Terms, or your account’s infringement of someone else’s rights. If you find yourself in a dispute with another user of Generation Success’s Services or a third party, we encourage you to contact the other party and try to resolve the dispute amicably. Case System. Members who are unable to resolve a dispute related to a transaction on our websites may participate in our case system. Generation Success will attempt to help you resolve disputes in good faith and based solely on our interpretation of our policies, in our sole discretion; we will not make judgments regarding legal issues or claims. Generation Success has no obligation to resolve any disputes. Release of Generation Success. You release Generation Success from any claims, demands, and damages arising out of disputes with other users or parties. Governing Law. The Terms are governed by the laws of the United Kingdom, without regard to its conflict of laws rules, and the laws of the United Kingdom. These laws will apply no matter where in the world you live, but if you live outside of the United Kingdom, you may be entitled to the protection of the mandatory consumer protection provisions of your local consumer protection law. Arbitration. You and Generation Success agree that any dispute or claim arising from or relating to the Terms shall be finally settled by final and binding arbitration, using the English language, administered by the London Court of International Arbitration (LCIA) under its Commercial Arbitration Rules then in effect (those rules are deemed to be incorporated by reference into this section, and as of the date of these.Arbitration will be handled by a sole arbitrator in accordance with those rules. Judgment on the arbitration award may be entered in any court that has jurisdiction. Any arbitration under the Terms will take place on an individual basis – class arbitrations and class actions are not permitted. You understand that by agreeing to the Terms, you and Generation Successare each waiving the right to trial by jury or to participate in a class action or class arbitration. Notwithstanding the foregoing, each party shall have the right to bring an action in a court of proper jurisdiction for injunctive or other equitable or conservatory relief, pending a final decision by the arbitrator. You may instead assert your claim in “small claims” court, but only if your claim qualifies, your claim remains in such court, and your claim remains on an individual, non-representative, and non-class basis. Costs of Arbitration. Payment for any and all reasonable AAA filing, administrative, and arbitrator fees will be in accordance with the Consumer Arbitration Rules. If the value of your claim does not exceed £50, Generation Success will pay for the reasonable filing, administrative, and arbitrator fees associated with the arbitration, unless the arbitrator finds that either the substance of your claim or the relief sought was frivolous or brought for an improper purpose. Forum. We’re based in London, United Kingdom, so any legal action against Generation Success related to our Services must be filed and take place in London. That means the seat of any arbitration shall be London. For any actions not subject to arbitration, you (where your contract is with Generation Success) and Generation Success agree to submit to the personal jurisdiction of a state court located in London, United Kingdom, you and Generation Success agree to submit to the personal jurisdiction of the courts of UK. Modifications. If we make any changes to this “Disputes with Generation Success” section after the date you last accepted the Terms, those changes will not apply to any claims filed in a legal proceeding against Generation Success prior to the date the changes became effective. Generation Success will notify you of substantive changes to the “Disputes with Generation Success” section at least 30 days prior to the date the change will become effective. If you do not agree to the modified terms, you may send Generation Success a written notification (including email) or close your account within those 30 days. By rejecting a modified term or permanently closing your account, you agree to arbitrate any disputes between you and Generation Success in accordance with the provisions of this “Disputes with Generation Success” section as of the date you last accepted the Terms, including any changes made prior to your rejection. If you reopen your closed account or create a new account, you agree to be bound by the current version of the Terms. The Terms, including all of the policies that make up the Terms, supersede any other agreement between you and Generation Success regarding the Services. If any part of the Terms is found to be unenforceable, that part will be limited to the minimum extent necessary so that the Terms will otherwise remain in full force and effect. Our failure to enforce any part of the Terms is not a waiver of our right to later enforce that or any other part of the Terms. We may assign any of our rights and obligations under the Terms. At Generation Success, we care deeply about privacy. We believe in transparency, and we’re committed to being upfront about our privacy practices, including how we treat your personal information. We know you care about your privacy too, so we provide settings that allow you to choose how certain information is used by Generation Success. This policy explains our privacy practices for Generation Success.com and our other services provided by our third-party partners (Eventsbrite, Mailchimp) and other companies that we use. By using the Services, you acknowledge that Generation Success will use your information in the United Kingdoms, Ireland and any other country where Generation Success operates. Please be aware that the privacy laws and standards in certain countries, including the rights of authorities to access your personal information, may differ from those that apply in the country in which you reside. We will transfer personal information only to these countries to which we are permitted by law to transfer personal information, and we will take steps to ensure that your personal information continues to enjoy appropriate protections. Please read on to learn more about how we protect personal information that’s transferred outside of Europe. Registration, Account Setup, Service Usage: In order to use the Services, you need to provide us with a valid email address, and for Services that require registration, a name associated with your account that you can choose and that represents your identity on Generation Success. You may review, change, or remove that name through your account settings. You need to provide this information to enable us to provide you with the Services. Depending on which services you choose to use, additional information, such name, billing and payment information (including billing contact name, address, telephone number, credit card information), a telephone number, and/or a physical postal address, may be necessary in order for us to provide a particular service. You are required to provide us with this information to sign up and we will also need it to provide certain services. For example, we need a email address if you are buying a ticket for a event. Our Third-party processors may need to store credit card information (or arrange for it to be stored) and use it for both billing and payment purposes. Depending on your local jurisdiction, you can also choose to allow us to save your credit card information to facilitate the checkout process for future purchases. In order to sign up for membership for Generation Success, you may be required to complete a registration form; information that you submit through the registration processes will not be displayed publicly and will only be used internally by Generation Success, unless otherwise specified. Profile: You may provide your name and other personal information (such as age, gender, location) in connection with your account and activity. Your information can be edited or removed from our third-party supplier/partner Eventbrite or you can send us an email to edit or remove this information from your account settings if you have registered through Join-It. Automated Information: Generation Success automatically receives and records information from your browser or your mobile device when you visit the Site or use certain other Services, such as your IP address or unique device identifier, cookies and data about which pages you visit in order to allow us to operate and provide the Services. This information is stored in log files and is collected automatically. We may combine this information from your browser or your mobile device with other information that we or our partners collect about you, including across devices. This information is used to prevent fraud and to keep the Services secure, to analyse and understand how the Services work for members and visitors, and to provide advertising, including across your devices, and a more personalised experience for members and visitors. Location Information: We may collect information about your use of the Services for advertising, analytics, to serve content and to protect the Services, including your IP address, browser information (including referrers), device information (such as iOS IDFA, IDFV for limited non-advertising purposes, Android AAID, and, when enabled by you, location information provided by your device). We may obtain location information you provide in your profile or your IP address. With your consent, we may also determine location by using other information from your device, such as precise location information from GPS or information about wireless networks or cell towers near your mobile device. We may use and store information about your location to provide features and to improve and customise the Services, for example, for Generation Success’s internal analytics and performance monitoring; localisation, regional requirements, and policies for the Services; for local content, search results, and recommendations; for mapping services; and (using non-precise location information) marketing. If you have consented to share your precise device location details but would no longer like to continue sharing that information with us, you may revoke your consent to the sharing of that information through the settings on the Apps or on your mobile device. Certain non-precise location services, such as for security and localised policies based on your IP address or submitted address, are critical for the site to function. We will only share your geo-location details with third parties (like our mapping, payments, or, to the extent applicable, advertising providers) in order to provide you with the Services. Information from Third Parties: Some members or visitors may choose to connect to Generation Success or register for Generation Success event using an external third-party application, such as Facebook, or Eventbrite, Join-It. Generation Success may receive information from those connected third-party applications. If you choose to connect your account to a third-party application, Generation Success may receive information from that application. We may also collect public information in order to connect with you. We may use that information as part of providing the Services to you. You can also choose to share some of your activity on Generation Success on certain social media networks, which are connected to you, and you can revoke your permission anytime in your account settings through Eventbrite or sending an email to the Generation Success team to revoke your permission from Join-It. Non-Member Information: Generation Success may receive or obtain information (for example, an email address or IP address) about a person who is not yet a registered Generation Success member (a “non-member”) in connection with certain Generation Success features, such as when a non-member chooses to subscribe to Generation Success newsletter, a member invites a non-member to visit the Site, a member uploads non-member information using the contact uploader feature, a non-member engages in a transaction, or a non-member uses the Event Checkout feature when making a purchase through one of the Services. Non-member information is used only for the purposes disclosed when it was submitted to Generation Success or to facilitate action authorised by the non-member. We know that members of our community value having control over their own information, so Generation Success gives you the choice of providing, editing or removing certain information, as well as choices about how we contact you. You may change or correct your Generation Success account information or event information through Eventbrite website or through the ticket confirmation email sent to the client. You may also remove certain optional information that you no longer wish to be publicly visible through the Services, such as your name. You can also request the deletion of the personal information in your account. Depending on your location, you may also have certain additional rights with respect to your information, such as: (i) data access and portability (including the right to obtain a copy of your personal data you provided to Generation Success, via your settings); (ii) data correction (including the ability to update your personal data, in many cases via settings); (iii) data deletion (including the right to have Generation Success delete your personal information, except information we are required to retain, by contacting us); and (iv) withdrawal of consent or objection to processing (including, in limited circumstances, the right to ask Generation Success to stop processing your personal data, with some exceptions, by contacting us). We use non-technically necessary cookies and similar technologies. You may also control the receipt of certain types of communications from Generation Success in your account settings. Generation Success may send you messages about the Services or your activity. Some of these messages are required, service-related messages for members (such as transactional messages or legal notices). Other messages are not required, such as newsletters. You can control which optional messages you choose to receive by changing your account settings, and you can learn more in the “Messages from Generation Success” section of this policy. On occasion, Generation Success may need to contact you. Primarily, these messages are delivered by email or by push notifications, and every account is required to keep a valid email address on file to receive messages. Generation Success may also contact you by telephone to provide member support or for transaction-related purposes if you request that we call you. Additionally, and with your consent, Generation Success may send you an SMS (or similar) message or physical mail in order to provide you with customer support or to provide you with information about services or events that you may find of interest. You may update your contact preferences in your account settings. Some messages from Generation Success are service-related and necessary for members and Event Guest Checkout users. You agree that Generation Success can send you non-marketing emails or messages, such as those related to transactions, your account, security, or product changes. Examples of service-related messages include an email address confirmation/welcome email when you register your account, notification of event registration, service availability, modification of key features or functions, relaying conversations with Generation Success’s support team. When you register for an event, membership, subscribe to a newsletter, or provide us with your email address or phone number such as for a Event Guest Checkout purchase, you receive notice of and agree (in some jurisdictions and situations, by an additional unambiguous consent) to receive marketing emails and messages from us. You can unsubscribe at any time from marketing emails through the opt-out link included in marketing emails or messages. Members may also control some marketing emails or messages through their account settings as well as through the opt-out link included in marketing emails or messages. Recipients of email invitations may opt out of receiving future invitations by following instructions in the email invitation message. You may send an invitation only to someone who has given you consent to receive one. Generation Success is a community. We offer several features that allow members to connect and communicate in public or semi-public spaces, such as Forums, Teams and at Events. You don’t have to use these features, but if you do, please use common sense and good judgment when posting in these community spaces or sharing your personal information with others through the Services. Be aware that any personal information that you choose to submit there can be read, collected, or used by others, or could be used to send unsolicited messages to you. We may engage certain third parties to assist in providing community services to you and, in the context of that relationship, we need to share some of your information with such third parties in order to provide that service. Generation Success generally does not remove content from community spaces, and your posts may remain public after your account is closed, although your name will no longer be displayed alongside the post. You are responsible for the personal information that you choose to post in community spaces through the Services. Another member may follow your public activity on the Site to receive updates, such as when you add an item to your public Favourites. You may choose to make certain activities private through your account settings. After a member has begun following your activity, you have the option to block that member if you do not wish to share your updates with that specific person. We respect your privacy. Generation Success will not disclose your name, email address or other personal information to third parties without your consent, except as specified in this policy. We use your information to provide and improve the Services and our products, for billing and payments, for identification and authentication, for targeted online and offline marketing including through tools like Facebook Custom Audience and Google Customer Match, to contact members or interested parties, and for general research and aggregate reporting. We may learn the sorts of products that you’re interested in from your browsing and purchasing (for events) behaviour on (and off) the Site and suggest potential purchases as a result. As a core part of our Services, we have a legitimate interest in customising your on-site experience to help you discover relevant items and recommended purchases. Similarly, we or our third-party partners may advertise our Services or our third-party’s products through a variety of different mediums and rely on your consent to do so off-site. As part of this, we may work with advertising partners such as Facebook or Google. If Generation Success receives a lawful, verified request for a member’s records or information in one of the limited circumstances described in the previous paragraph, Generation Success may disclose personal information, which may include, but may not be limited to, a member’s name, address, phone number, email address, and company name. Find out more about how Generation Success responds to requests for records or information about members of Generation Success’s community in our Request for Information Policy. Aggregated Information: Generation Success may share demographic information with business partners, but it will be aggregated and de-personalised, so that personal information is not revealed. Service Providers: Generation Success also needs to engage third-party companies and individuals (such as payment processors, research companies, and analytics and security providers) to help us operate, provide, and market the Services. These third parties have only limited access to your information, may use your information only to perform these tasks on our behalf, and are obligated to Generation Success not to disclose or use your information for other purposes. Our engagement of service providers is often necessary for us to provide the Services to you, particularly where such companies play important roles like processing payments and shipments and helping us keep our Service operating and secure. In some other cases, these service providers aren’t strictly necessary for us to provide the Services, but help us make it better, like by helping us conduct research into how we could better serve our users. In these latter cases, we have a legitimate interest in working with service providers to make our Services better. We can speak only for ourselves; this policy does not apply to the practices of third parties that Generation Success does not own or control or individuals that Generation Success does not employ or manage. If you provide your information to others, different practices may apply to the use or disclosure of the information that you provide to them. Generation Success does not control the privacy policies of third parties, including other members who sell using the Services or API users. Generation Success is not responsible for the privacy or security practices of these sellers, API users, or other websites on the Internet, even those linked to or from the Services. We encourage you to read the privacy policies and ask questions of third parties before you disclose your personal information to them. For the purposes of European law, these sellers and API users are independent controllers of data, which means that they are responsible for providing and complying with their own policies relating to any personal information they obtain in connection with the Services. Generation Success operates a UK operated business. We do not have any need at the moment to transfer your information to any affiliates outside the UK. The United States, European Economic Area (“EEA”) Member States, and other countries all have different laws. If your information is moved from your home country to another country, the laws and rules that protect your personal information in the country to which your information is transferred may be different from those in the country in which you live. For example, the circumstances in which law enforcement can access personal information may vary from country to country. In particular, if your information is in the US, it may be accessed by government authorities in accordance with US law. The European Commission has adopted standard contractual clauses (also known as Model Clauses), which provide safeguards for personal information that is transferred outside of Europe. We often use these Model Clauses when transferring personal information outside of Europe. You can request a copy of our Model Clauses by emailing info@generation-success.com. Generation Success does not participate in Privacy Shield at this time. The security of your personal information is important to us. We follow generally accepted standards to protect the personal information submitted to us, both during transmission and after it is received. Your account information is protected by a password. It is important that you protect against unauthorised access to your account and information by choosing your password carefully and by keeping your password and computer secure, such as by signing out after using the Services. If you have any questions about the security of your personal information, you can contact us at info@Generation-success.com. Generation Success encrypts certain information (such as credit card numbers) using secure socket layer technology (SSL). Generation Success follows generally accepted industry standards to protect the personal information submitted to us, both during transmission and after it is received. Unfortunately, no method of transmission over the internet or method of electronic storage is 100% secure. Therefore, while we strive to protect your personal information, we can’t guarantee its absolute security. Generation Success will retain your information only for as long as is necessary for the purposes set out in this policy, for as long as your account is active (i.e., for the lifetime of your Generation Success member account), as described in this policy, or as needed to provide the Services to you. If you no longer want Generation Success to use your information to provide the Services to you, you may close your account. Generation Success will retain and use your information to the extent necessary to comply with our legal obligations (for example, if we are required to retain your information to comply with applicable tax/revenue laws), resolve disputes, enforce our agreements, and as otherwise described in this policy. In addition, Generation Success third-party partners may also be required to retain and use your information in order to comply with their legal obligations. Please note that closing your account may not free up your email address, username for reuse on a new account. We also retain log files for internal analysis purposes. These log files are generally retained for a brief period of time, except in cases where they are used for site safety and security, to improve site functionality, or we are legally obligated to retain them for longer time periods. You may benefit from a number of rights in relation to your information that we process. Some rights apply only in certain limited cases, depending on your location. If you would like to manage, change, limit, or delete your personal information, you can do so via your Generation Success account settings or by contacting us. Upon request, Generation Success will provide you with information about whether we hold any of your personal information. By visiting your account settings, you can access, correct, change, and delete certain personal information associated with your account. In certain cases where we process your information, you may also have a right to restrict or limit the ways in which we use your personal information. In certain circumstances, you also have the right to request the deletion of your personal information, and to obtain a copy of your personal information in an easily accessible format. Please ensure you’ve read the options you have under the “Choice & Control” section above. If you need further assistance, you can contact Generation Success through one of the channels listed below under “Contact”.We will respond to your request within a reasonable timeframe. Where you have provided your consent, you have the right to withdraw your consent to our processing of your information and your use of the Services. For example, you can withdraw your consent to email marketing by using the unsubscribe link in such communications or by changing your account settings. You can choose to withdraw your consent to our processing of your information and your use of the Services at any time by closing your account through your account settings and then emailing info@generation-success.com to request that your personal information be deleted, except for information that we are required to retain. This deletion is permanent and your account cannot be reinstated. Office of the Data Protection Commissioner. If you live in the EEA, you may also file a complaint with your local data protection regulator. You must be a current paying member to use the services at any given time. Once a service has been booked and confirmed, it is not refundable if you choose to cancel it or otherwise are unable to make the appointment or event. Mentors / advisors will be allocated within 8 weeks of you submitting your request form. When allocating mentors / advisors to you, we will make every effort to meet your requirements, but the allocated mentor / advisor will be the closest match from our pool of mentors / advisors. Failure to maintain monthly payments will automatically cause your account to be downgraded to the Free option. Any event or workshop is allocated to members on a first-come, first served basis and we cannot guarantee availability for every member. You can request to upgrade your membership package at any time by emailing membership@generation-success.co.uk. You can only request to downgrade or cancel your membership package after the initial six months had ended. Refunds will not be provided in the event that you choose not to take part in any of the events or use any of our services. If you have any comments to make about our service, please contact membership@generation-success.co.uk. Life/Business Coaching is a conversation where our Life coach is able to lead you towards an “aha!” moment by asking several challenging questions. Designed to help you figure out what your life goal is about, or what you want to achieve with your career. Currently based in Germany most of his coaching services will be conducted online via Skype. Generating your success and Advanced Career planning members are entitled to 6 months of 1-1 mentoring. Our mentors are top professionals in their field and range from different industries from law to business to education to technology to finance to baking to creative industries to so much more. We will assign mentors to members once they join and they may meet with the mentors face to face or via Skype. The members may also requested to be paired up with a certain mentor although it is not a guarantee that the member will be paired with the requested professional. Signing up for our dream hunter program will give you full access and limited access to our Virtual Learning platform. The Virtual learning platform will give members tools for self development in the form of ebooks, videos webinars and career path counseling. Think ‘speed dating’, but for your career! If you ever wanted your own board of senior advisers, people who are established business leaders who have been there and done it. They will advise you on how to succeed in your careers. If you’re lucky they may also be able to share their contacts with you! In 1 hour you will create 4 mentoring relationships and spend 15 minutes with a mentor. 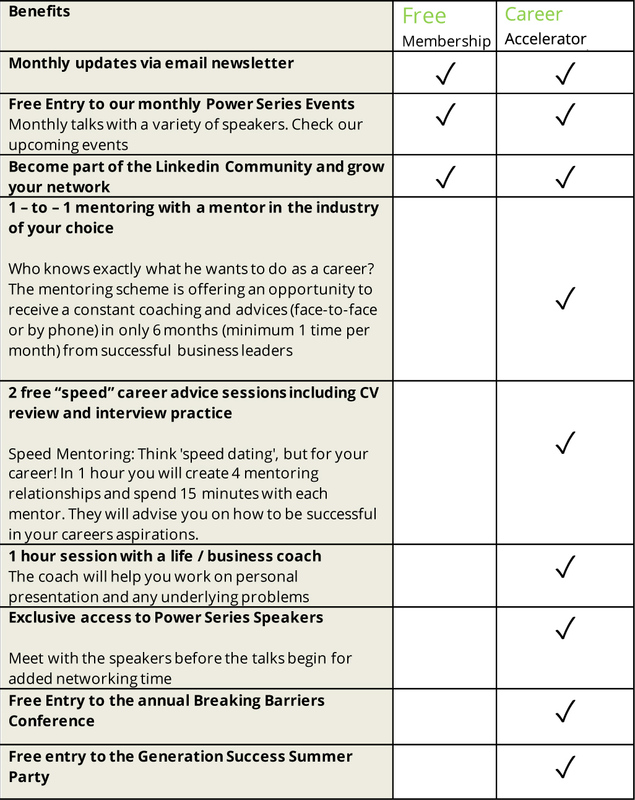 If you would like to have this opportunity the speed mentoring will take place an hour before the power series event. This is a unique networking opportunity for YOU to hear from a panel of the UK’s leading legal professionals who will be sharing their career journey and lessons with you, the Generation Success network. Join us in listening to our panel’s inspirational stories, secrets to career success and grab this opportunity to network with our speakers and other leading legal professionals. If you were ever put off going after a career in Law by thinking you might not have the right skills and tools, please think again.